While Greensboro managed to escape the worst of Hurricane Florence, our neighbors to the east weren’t as fortunate. As you’ve seen from the news, the coastal area of North Carolina, as well as nearby cities including New Bern and Lumberton, suffered the most devastation. Recovery and rebuilding efforts are already underway, but these areas will have a long way to go until they are completely recovered from this devastating storm and they need ongoing help. Donating money is often the most effective way to help in the wake of a natural disaster because it helps get resources to the field quickly. There are also other ways to help including donating needed items and volunteering your time. Here is a list of volunteer and financial support opportunities to help people affected by Hurricane Florence. • 1075KZL and Rock 92 are collecting supplies to stuff tractor trailers at the Target Shopping Center on New Garden Road in Greensboro. The truck will depart on Friday, Sept. 21, and will be delivered to New Bern. Visit their website for a list of needed supplies and more information. 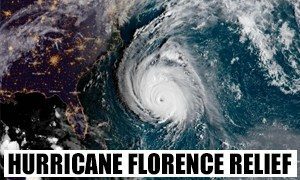 • WXII 12 News is partnering with the Red Cross to raise money to help Hurricane Florence victims and will host a live telethon from 6 a.m. to 9 p.m. on Thursday, Sept. 20. Call 336-703-6280 to donate in the telethon or you click here donate online. • Harris Teeter grocery store chains are is matching shopper donations up to $125,000 made inside their stores through Sept. 30. One hundred percent of the in-store donations will go to the Red Cross. • Buy a Panthers #CAREolinas t-shirt. The Carolina Panthers have partnered with VisitNC to raise money for the governor’s North Carolina Disaster Relief Fund and the Central Carolina Community Foundation by selling t-shirts that celebrate Carolina unity. Click here to buy a t-shirt. • North Carolina Disaster Relief Fund activated by Gov. Roy Cooper’s office is accepting donations to support North Carolina’s response to Hurricane Florence. Go to https://www.rebuild.nc.gov/ or text FLORENCE to 20222 to donate. • There is an official GoFundMe page set up for Hurricane Florence victims where you can make an online donation. • Second Harvest Food Bank of Northwest NC has activated a giving page for donations to support their network response efforts, including securing staging and distributing water and food for impacted families. Click here to donate. • The Salvation Army is mobilizing to help those affected by the storm. Click here to donate. • Samaritan’s Purse U.S. Disaster Relief will be helping homeowners recover from the devastating effects of Hurricane Florence. Click here to make a donation. • Americane Humane is helping animals impacted by the storm, click here to donate. • If you are a nurse, the state of North Carolina is looking for volunteers to go into impacted areas. If you would like more information, this article has details.